Dress weather is here in Boston (to stay I hope) but I still see a few people in their winter coats in the mornings. I found an old BR dress in my closet (from 2008/2009) that I wore to work today. I remember purchasing the dress because I loved the pleats which make an otherwise boring one-color dress interesting. 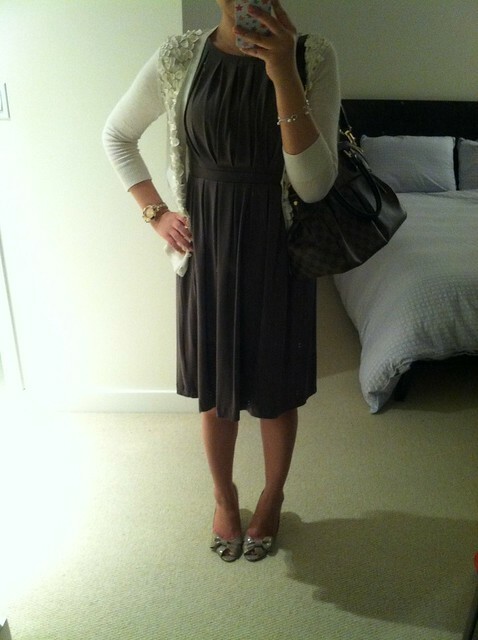 It was a bit chilly with the rain so I also brought my favorite cardigan purchased this past winter at Club Monaco. I adore the delicate petal applique and happily pay extra to have the cleaners take care of it. Once I arrived in the office I pulled out my AT taupe peep toe pumps which have been sorely neglected since last year (they also need to be resoled to make them last longer).